Welcome to the Ohio Academy of History Newsletter. The OAH Newsletter is published twice a year as a benefit to Academy members. 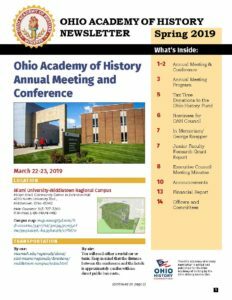 Each issue includes feature articles by history professionals, updates from Academy officers and committees, and faculty news from history departments around Ohio. We are pleased to provide an online version of the OAH Newsletter to our website visitors. Please click on a link below to view an issue.